(Riyadh, KSA) – In the Kingdom of Saudi Arabia (KSA), the Royal Saudi Naval Force (RSNF) is the naval branch of the armed forces. Founded in 1960, the RSNF was developed largely as a defensive force to protect against the expanding Imperial Iranian Navy in the Persian Gulf and Red Sea. Today, with assistance from the United States, the RSNF has about 15,000 officers and men, including 3,000 Marines with advanced command, control and fighting capabilities. 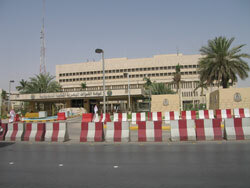 In Riyadh, the RSNF had a problem with their headquarters facility. Like any government facility, they were looking to reduce energy costs while facing higher operating costs. But the issues faced by the RSNF were exacerbated by their aging pneumatic control system, installed 25 years earlier. The knowledge and skills needed to maintain such a system were becoming as obsolete as the system itself. That’s when the RSNF began planning a significant retrofit project to replace pneumatic control with electronic and digital control. Their established mechanical/electrical contractor, Gulf Group, recommended Bareeq Al-Tamayez for Trading Services (Bareeq), a local energy management contractor and an authorized representative of KMC Controls, to install a fully automated system. 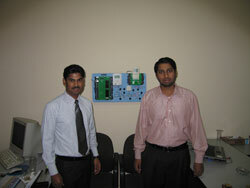 In turn, Bareeq recommended a BACnet solution. 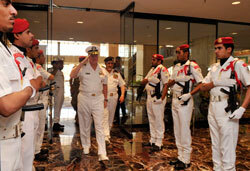 The RSNF headquarters in Riyadh is a 6-story building with 2 sub-basements of approximately 150,000 square feet. The specified project consisted of retrofitting all existing mechanical systems from pneumatic control to direct digital control. The retrofit included the central AHU systems and the smoke control system. The fire suppression system was also integrated into the new building management system. Two large AHUs serve the core of the building providing over 50,000 CFM of air each. 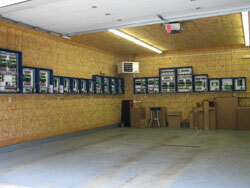 They were brought under control by KMC BACnet Advanced Application Controllers. The associated fan systems had three parallel fans with pneumatically powered inlet guide vanes that needed to be retrofitted. Bareeq designed a special retrofit linkage kit that enabled the existing 60PSI, 4” linear stroke pneumatic actuators to be replaced by a tandem coupled electronic actuator set consisting of dual KMC MEP-7852 (320 in. lb.) fail-safe actuators. The actuators ensure tight close-off when needed and smooth control throughout their range. The retrofit of the inlet guide vanes was chosen because the existing motors were not candidates for VFDs due to their age and design. Individual zone controls were retrofitted with electronic VAV thermostat/room controllers from Tongdy Control Technology Co., Ltd. Meanwhile, MEP-4002 electronic proportional actuators from KMC Controls were used on the existing bypass-type VAV terminals. Gulf Group’s contracting subsidiary installed all necessary control wiring for the new 330+ VAV damper operators & thermostats, 65+ smoke control dampers, and all other sensors & actuators. One of the more significant aspects of the retrofit is an integrated smoke control system using KMC’s UL 864 (Category UUKL) BAC-5831 and 5801 series controllers. The digital smoke control panels replaced larger pneumatic manual control panels but with much smaller footprints. RSNF even noted an added benefit of increased storage space in the mechanical rooms as a result! More importantly, the smoke control system manages over 65 dedicated smoke control dampers in the supply, return, and exhaust air streams as well as 12 staircase pressurization and smoke exhaust fans. Additionally, the facility’s high-security protection areas are provided with a Halon-based fire suppression system that is monitored from the BACnet DDC system with associated control actions taken when necessary. The entire digital system and electronic devices are monitored by KMC TotalControl operator workstation offering a complete graphical user interface and web-based remote capabilities. Significantly, the retrofit project was executed in phases during working hours without disruption to the operations or staff of the RSNF. For instance, the BACnet DDC system was configured and programmed “off-line” by a U.S.-based KMC representative. 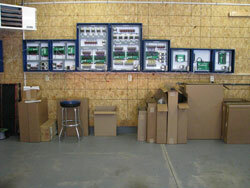 Control panels were pre-loaded and pre-tested with application software prior to shipment to the site. As a result, only minor variations and changes were required during the commissioning process. The new, automated system has significantly improved both comfort levels and energy usage throughout the RSNF headquarters. RSNF officials have indicated that they are experiencing an 18% reduction in KWH consumption due to the implementation of a fully automated BACnet control system. In addition, they anecdotally note a greater peace-of-mind that critical, life-safety systems are now under digital control. Finally, they enjoy increased visibility of building performance through displayed data which was impossible under pneumatic control.